With their big fight just days away, both Derek Ennis and Gabriel Rosado faced off at the final presser Monday night at the South Philly Champps Americana restaurant on Columbus Boulevard. A large crowd gathered to see the City's two top junior middleweights for the last time before they step into the ring on Friday night. Both boxers appeared confident, ready, and relaxed. Now it's up to them to produce a fight that lives up to the expectations and promise of this excellent on-paper match-up. Much has been said up to now about this all-Philly bout. Some reporters have condemned the pairing of two rising Philadelphians, claiming such a fight is unnecessary and wasteful of our local talent. But Hall of Fame promoter J Russell Peltz, couldn't disagree more. 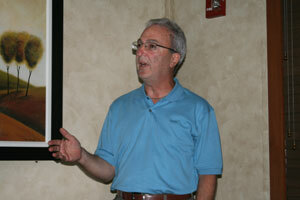 He defended his latest promotion at the press conference. "Listen, this is ridiculous," Peltz said. "Philly history was built on Briscoe vs. Hart, Hayward vs. Percy Manning, Hart vs. Boogaloo Watts. These are the fights that made Philly great. These are the ones people talk about." 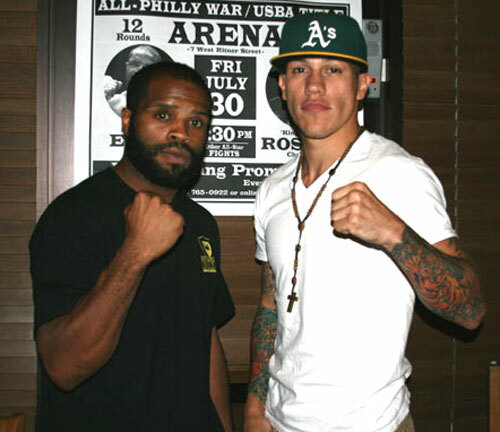 On July 30th, Derek Ennis and Gabriel Rosado will get their chance to add to Philly's legendary ring legacy. Their fight has all the makings of a modern classic. The fighter's styles suggest that the meeting could be a give-and-take contest. It's boxer vs. puncher. Further, with the USBA belt and a Top-10 world ranking hanging in the balance for the winner, there is plenty for Derek and Gabe to fight for. And finally, with everyone watching and waiting to see if Ennis-Rosado can stack up to the memorable fights of the more golden eras of local boxing, the time for each fighter to make good is right now. That usually makes for a good fight. There may be other days and other fights in the future for these two. But if they are smart, they'll do everything they can to win this one. An opportunity like this, doesn't come that often. Neither fighter seemed to be affected by the Philly vs. Philly aspect of the fight. "I'm really just concentrating on winning that belt," said Rosado. "I'm not really caught up in the hype of the Philadelphia thing. He has the title and that's what I want. Yeah, the bragging rights of the city mean something, but I've got my eye on the prize, and that's the title." Ennis agreed that fighting a fellow Philadelphian would not affect him. "I'm looking at this like a regular fight. It's like a basketball game. It's just something we have to do. We talk now and we'll be the same after this one is over." 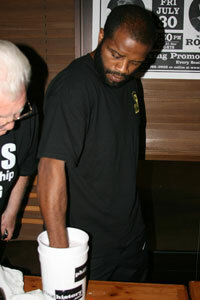 Ennis, the defending USBA champion, enters Friday's bout with a solid 21-2-1 (13 KO) record. He's looked especially good in two of his most recent outings. Of course there was his title-winning effort against Eromosele Albert last October. In that 12-round Blue Horizon war, Ennis struggled but rose to the challenge and defeated the tough and talented Nigerian. Albert was his best foe to date, and Ennis showed patience, ruggedness and enough skill to wrap up the unanimous decision. It was a mature and blossoming Ennis, and it was clear on that night that he could compete at the next level. The fight was named the IBF's "fight of the year" for 2009. In his most recent start, Ennis again showed some serious grit with another difficult points win at the Blue, this one against Jose Gonzalez, who came to fight and gave Ennis all he could handle. But once again, Derek toughed it out and produced a victory. In both fights, he displayed fast hands, pin-point accuracy, extremely effective body work, and a sudden appetite for trench warfare. "I could have boxed more and made it easier", Ennis said Monday. "But I slugged it out and still won. Sometimes you have to do different things". One thing is for sure, these were two fine performances by Ennis that proved he could do more than overwhelm an easy opponent. Especially against Albert, Ennis showed that he had arrived, and unknowingly created a blueprint for his fight against Rosado on that night. If he brings the same combination of style and stamina, he could give Rosado fits on Friday. 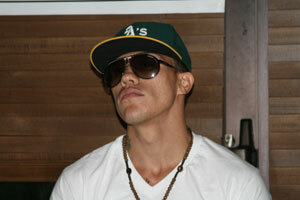 However, Gabriel Rosado has been in plenty of tough fights. He's been matched over his head on a number of occasions. His current 14-4 (8 KO) record shows wins over some excellent competition like former world champion Kassim Ouma, a then-undefeated James Moore, a seasoned Saul Roman, and another skilled Philadelphian, Latif Mundy. Rosado squeaked out a couple of those wins, but proved himself to be an over-achiever every time out and emerged a real battle-tested warrior. "I didn't have a long amateur background. I learned on the job as a professional. If you look at my fights, you see progression." Going in his favor, is the fact that this match was made not by a house fighter or a home team looking for a beatable opponent. 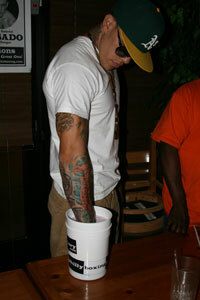 The fight was sanctioned by the USBA who deemed Rosado the mandatory challenger for Ennis' crown. So Rosado sits poised for Friday's match in an unusual position. He hasn't been overmatched this time. He has received a gift that probably wouldn't have come without the influence of the sanctioning body. But does this make Rosado the favorite? With advantages in experience, power and size, it appears he might be. But Ennis brings an edge in hand speed, defense and as the incumbent champion, can argue that he has the upper hand going in. On paper, this fight looks like a natural. Call it complimentary styles. The fight could play out in either direction. So it's up to one of the fighters to come out on Friday and take advantage of the moment. Let's hope they both give it everything they've got. "This match is a great thing. I've trained hard and I'm waiting to get it on," said Ennis. "I'm excited. This fight is everything that me and my trainer Billy Briscoe have been working for. I'm just glad the opportunity presented itself," Rosado said. Both fighters were very cordial with each other at the press conference. There seems to be respect between the two. All the ribbing was good natured. "I'd do just about anything to win this fight", Rosado said. "Don't bite me!" Ennis responded. "No. the fans will get their money's worth. It will be a classic, and I'll walk out with the USBA title", said Rosado. "You want to hold it for a while? 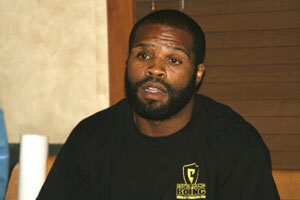 ", Ennis said, gesturing toward his championship belt lying on the table. Everyone laughed. Rosado decided to wait until Friday to see if he can hold Derek's belt for real. Peltz closed the press conference by saying, "Teddy Brenner, the legendary matchmaker said there are three reasons to make a fight. You have to ask yourself: 1) Do their styles make for a good match? 2) Does the fight lead the boxers anywhere? and 3) Would I pay for a ticket? For this fight, the answer is YES to all three." After the press conference, Philly Boxing History commemorated the occasion of this important fight by casting the fists of Ennis and Rosado in plaster. Both fighters stood side by side with their hands submerged in their own casting bucket, waiting for the signal to pull out their fist. Much of the crowd came up to the table and gathered around to watch the proceedings. It was as if the assembly just couldn't wait until Friday to see the fighters do their thing. So they treated the fist casting as round one. The spectators watched and called out to both boxers. It seems everyone is getting anxious for this fight, and luckily there are just three days to go.